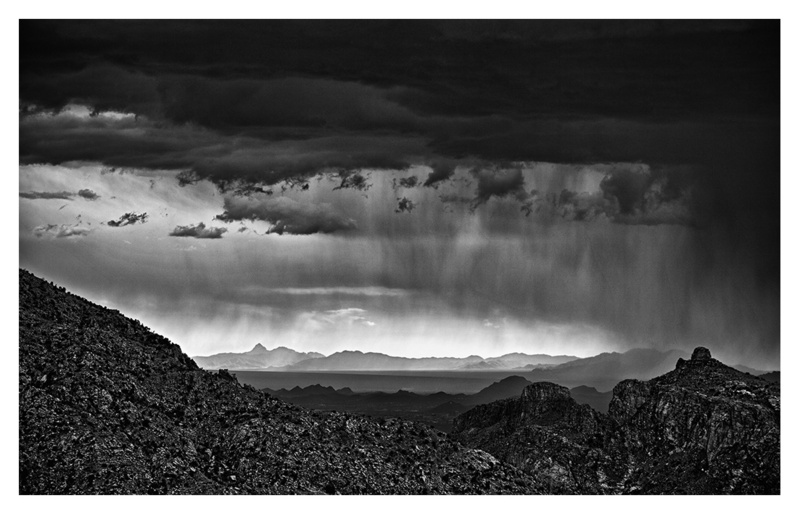 While climbing on one of the fins at Windy Point (along the Catalina Highway outside Tucson, AZ) in August, I watched a monsoon storm rumble across the valley below. I took a few minutes to photograph the storm clouds as they approached us. After I drove home I realized that I had also captured a lightning bolt in the panorama. After arriving in Boulder, I noticed flashing light off to the east through the trees. I couldn’t hear the thunder, but lightning was striking every half second in the thunderstorm over the plains. I drove up the hill near the NCAR Mesa Lab and took a few 30-second exposures of this storm cloud before heading to bed. Early in July, I drove back from Colorado to Arizona, paralleling the Mexico/US border on Interstate 10 in the intense summer Sonoran Desert sun. The temperature quickly dropped from over 100F to 75F as I passed into the shadow of the lumbering monsoon clouds. I pulled over on the side of the highway to take a panorama of the passing storm clouds before driving on through the rain, hail, and lightning.